Welcome to the forth and final Christmas Gift Guide, I hope you have enjoyed these little posts and that they were maybe helpful for someone in some way. 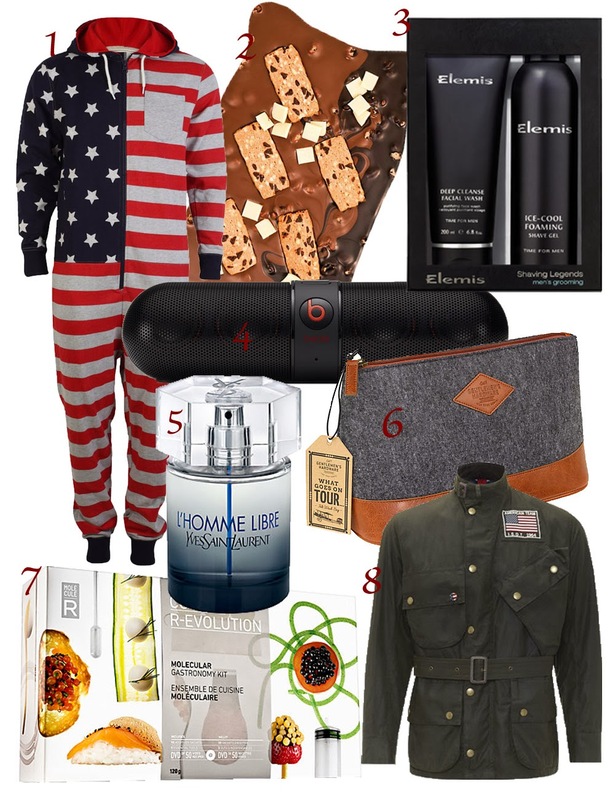 The last one is gift ideas for the man in your life, they can sometimes be so hard to buy for hopefully this can give you some ideas. 1. Tokyo Laundry Onesie - £34.99. I have looked through so many of these over the past few months and this is my favourite, it looks amazing and is super cosy! 2. Giant Rocky Road Slab - £16.99. If you are buying for anyone with a sweet tooth this year the "Giant Slabs" from Hotel Chocolat are a great gift. They come in a few different combinations but this I have been told is their biggest seller. It has cookies, white chocolate and crispy puffed rice, all mixed into delicious milk and dark chocolate...what's not to like? 3. Elemis Shaving Legends Set - £25. Skin care can be hard to buy for men, a lot of the time is can be stuff they won't really use. That is why I think shaving sets are a good way to go, I have heard lots of good things about these products and the packaging is just lovely and simple. 4. Beats Pill Speaker - £169.95. The beats speakers are a great gift for music lovers, they are wireless so can go anywhere you like and can be controlled by your phone. Also great for your home if you are short of space. 5. Yves Saint Laurent Libre - £34.65-£53.10. If I had to say my favourite men's fragrance just now this would be it, if you haven't tried it I urge you to go and give it a smell. I am not really sure how to describe the scent to you, other than gorgeous, so you would be best to try it for your self. 6. Gentlemans Hardware Wash Bag - £30. This is a matching wash bag to the shoe shine kit included in the "stocking fillers for him" guide. The whole range is lovely and really good quality, it would make a perfect gift maybe filled with some skin care. 7. Molecule-r Cuisine Gastronomy Kit - £36. This kit would make a perfect gift for any foodies you are buying for, it is so much more than just normal home cooking. 8. Barbour International Steve McQueen Jacket - £299. If you really want to splash out on something special Barbour do some really amazing jackets. The Barbour International from the Steve McQueen Collection is one of my favourites, a perfect gift for someone who would never normally buy this kind of thing for them self. Ok that onesie is too awesome!